When Christian Kandlbauer lost both of his arms in a work accident in 2005, he thought he’d lost his independence. But thanks to amazing advances in prosthesis technology, he now has two high-tech prosthetic arms that allow him to function in many of the ways he did before his accident – and they’re controlled by his thoughts. The arms, developed in a joint venture between the Otto Bock health care company and the Medical University of Vienna, were fitted in 2007. But before they could go on, Kandlbauer had to undergo a complex procedure to re-wire the nerves in his arm stumps, a procedure that only three surgeons in the world can perform. The nerves that used to control his arms were moved to his chest to allow him to control his new bionic arms via electronic sensors. Now, Kandlbauer moves his new arms the way he moved his old ones: he activates “muscle” movement with impulses from his brain. 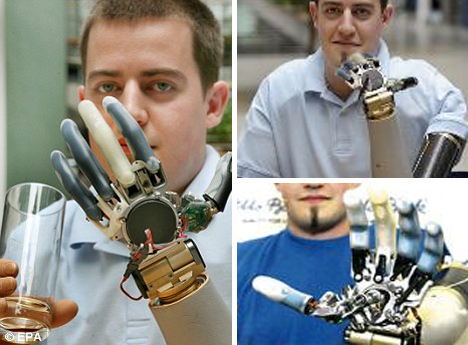 The prosthetic arms aren’t quite as articulate as natural arms, but they have seven degrees of movement as opposed to the three degrees of movement offered by conventional prostheses. And four years after losing his arms, Kandlbauer was able to achieve one of his biggest goals: he passed his driving test. He’s now able to drive himself around with the help of a modified vehicle, thanks to his high-tech arms. See more in Cybernetics or under Technology. November, 2009.